Week 3 saw me catch the girls cold, so 3 full of cold on week 3! At one point in the week I lost the ability to use my eyes, which made for rather a painful and scary time, thankfully though the girls seem better and I feel as if I am coming back to normality. 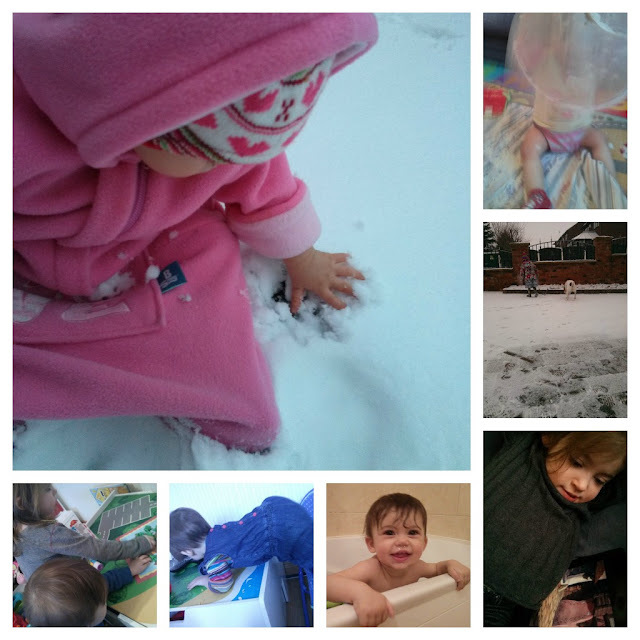 A week of snow fun, both indoor and out and a week of my youngest trying to escape from everything. Lovely photos, glad you are all on the mend now. The photo of your little one trying to escape from the bath is so sweet. I love the bath shot and that first one in the snow is lovely. I hope you're feeling better now. Glad you're feeling a bit better. I had a horrendous cold over new year and it took a couple of weeks to fully get over it. I'm so glad you mentioned the eyes thing, one twin had a high temp on Friday and Saturday night said she couldn't see anything - downright scary but thankfully it cleared up and now she's left with a cough. Yeah I have a cough now? Strange must be a bug going round. My right eye still hurts every now and again but nothing like they did. Great pictures, unfortunately the snow and cold weather seems to bring a lot of colds and illness, but glad you're on the way out now.Looks like you still made time for fun in the snow! Love the bath pic too! Always trying to make some outdoor time think fresh air does them good. Lovely photos, especially the one of the baby touching the snow. Hope you're all feeling better. I can almost sense her excitement through her little hand as she feels that snow for the first time, beautiful photograph as well on bottom right. You're girls have such stunning eyes that they really speak to the viewer! Hope your eyes are ok, how frightening! Did my comment go through?